Contrary to the world’s opinion, motherhood is the world’s oldest profession. From the beginning of mankind, moms are expected to be great wives, great housekeepers, great business partners, great influences on society, and available for everyone! Gen 2:15-25 The LORD God took the man and put him in the Garden of Eden to work it and take care of it. And the LORD God commanded the man, "You are free to eat from any tree in the garden; but you must not eat from the tree of the knowledge of good and evil, for when you eat of it you will surely die." The LORD God said, "It is not good for the man to be alone. I will make a helper suitable for him." Now the LORD God had formed out of the ground all the beasts of the field and all the birds of the air. He brought them to the man to see what he would name them; and whatever the man called each living creature, that was its name. So the man gave names to all the livestock, the birds of the air and all the beasts of the field. But for Adam no suitable helper was found. So the LORD God caused the man to fall into a deep sleep; and while he was sleeping, he took one of the man's ribs and closed up the place with flesh. Then the LORD God made a woman from the rib he had taken out of the man, and he brought her to the man. The man said, "This is now bone of my bones and flesh of my flesh; she shall be called 'woman, ' for she was taken out of man." For this reason a man will leave his father and mother and be united to his wife, and they will become one flesh. The man and his wife were both naked, and they felt no shame. It would be impossible to talk about God's plan for motherhood without recognizing that God requires a certain foundation prior to motherhood ... marriage! Unlike many in our society today, the Bible teaches that motherhood should not come first, marriage should! God's model begins with marriage—between a man and woman—to be partners for life. God saw that it was not good for man to be alone, so a helper was made for him—not another man, not a slave—an equal, a woman! God's plan for man was a single partner; therefore, only one woman was made! Ladies, you were designed perfectly by a perfect God. Woman was taken from man and created for a position of honor; that being, every man henceforth would be born of a woman. 1 Cor 11: 8-12 For man did not come from woman, but woman from man; neither was man created for woman, but woman for man. For this reason, and because of the angels, the woman ought to have a sign of authority on her head. In the Lord, however, woman is not independent of man, nor is man independent of woman. For as woman came from man, so also man is born of woman. But everything comes from God. Ladies, rejoice in your femininity! You were the very last creation of Almighty God! After He presented the woman to the man - it was then, and only then, that Almighty God declared His Creation "very good." Together, as well as individually, the man and woman reflected Almighty God’s image. They were united, one flesh; yet, they were different - one was male and the other was female. Together they formed the species called man. When Adam looked upon Eve, his first words were: "This is now bone of my bones and flesh of my flesh; she shall be called 'woman, ' for she was taken out of man." This was all he needed to be complete—this one woman, a suitable helper! Adam and Eve’s lives were perfect, at least for a while. It’s not clear how long the man and the woman reveled in divine goodness together in Eden. At some point, the devil appeared, promising a better life simply by eating the fruit of the tree of the knowledge of good and evil. The fruit is described as “pleasing to the eye and desirable for gaining wisdom,” and it proved too much of a temptation for the woman. She takes a bite and then gives some to her husband, who also eats. Immediately, their eyes were opened, and for the first time, humans experienced shame. Gen 3:8-24 Then the man and his wife heard the sound of the LORD God as he was walking in the garden in the cool of the day, and they hid from the LORD God among the trees of the garden. But the LORD God called to the man, "Where are you?" He answered, "I heard you in the garden, and I was afraid because I was naked; so I hid." And he said, "Who told you that you were naked? Have you eaten from the tree that I commanded you not to eat from?" The man said, "The woman you put here with me--she gave me some fruit from the tree, and I ate it." Then the LORD God said to the woman, "What is this you have done?" The woman said, "The serpent deceived me, and I ate." So the LORD God said to the serpent, "Because you have done this, "Cursed are you above all the livestock and all the wild animals! You will crawl on your belly and you will eat dust all the days of your life. And I will put enmity between you and the woman, and between your offspring and hers; he will crush your head, and you will strike his heel." To the woman he said, "I will greatly increase your pains in childbearing; with pain you will give birth to children. Your desire will be for your husband, and he will rule over you." To Adam he said, "Because you listened to your wife and ate from the tree about which I commanded you, 'You must not eat of it,' "Cursed is the ground because of you; through painful toil you will eat of it all the days of your life. It will produce thorns and thistles for you, and you will eat the plants of the field. By the sweat of your brow you will eat your food until you return to the ground, since from it you were taken; for dust you are and to dust you will return." Adam named his wife Eve, because she would become the mother of all the living. The LORD God made garments of skin for Adam and his wife and clothed them. And the LORD God said, "The man has now become like one of us, knowing good and evil. He must not be allowed to reach out his hand and take also from the tree of life and eat, and live forever." So the LORD God banished him from the Garden of Eden to work the ground from which he had been taken. After he drove the man out, he placed on the east side of the Garden of Eden cherubim and a flaming sword flashing back and forth to guard the way to the tree of life. After the woman listened to the tempter, after she ate of the forbidden tree, after she involved her husband, Adam, in rebellion, there was no doubt that she was guilty of sin! But, the covenant between Almighty God and mankind was made with Adam and not with Eve. Death did not come into the world through the woman, it came here through the man! The first man brought death into the world under the Old Covenant. The Son of Man - Jesus, the Christ – brought eternal life to the world, through a New Covenant God made with mankind. 1 Cor 15:21-22 For since death came through a man, the resurrection of the dead comes also through a man. For as in Adam all die, so in Christ all will be made alive. Somewhat surprisingly, right after God doles out the punishment and the humans are mired in guilt, Adam gives the woman another name. He called her “Eve,” which means “the mother of all living.” This woman disobeyed God and did the one thing God warned them would bring death. Still, Adam calls her the “mother of all life.” This is a beautiful act of love and forgiveness. Adam doesn’t call her a name to constantly blame her for the consequences of their sin. He accepts the responsibility for their sin and calls her a name reflecting the hope of God’s redemption. Human life will continue and the redeemer will come through this same woman. For Eve, there was a fresh ray of hope, for she realized that despite being a sinner, she could still serve her gracious and forgiving God by submitting to Adam, bearing his children, and becoming the mother of all mankind. What’s even more important is that Jesus, the Christ, would be her direct descendant and He would right the wrong that she had done! Eve’s name, the mother of all living, reflected the role that she would play in history: from death, would spring life - from darkness, would come light - from the curse, would come a blessing- from a sentence of death, would come redemption - and, from the despair of defeat, would come hope from faith in God! Although Eve was defeated in the battle at the tree of the knowledge of good and evil, Satan did not win the war! Eve had the privilege of being used by God to defeat Satan through motherhood! One day it will be her "seed", the Messiah, who will crush the serpent’s head. No mother should ever feel inferior to any career, for not only does God consider it a high honor to be a mother, but our children, whether they understand it or not, look to you, Mom, for their guidance. 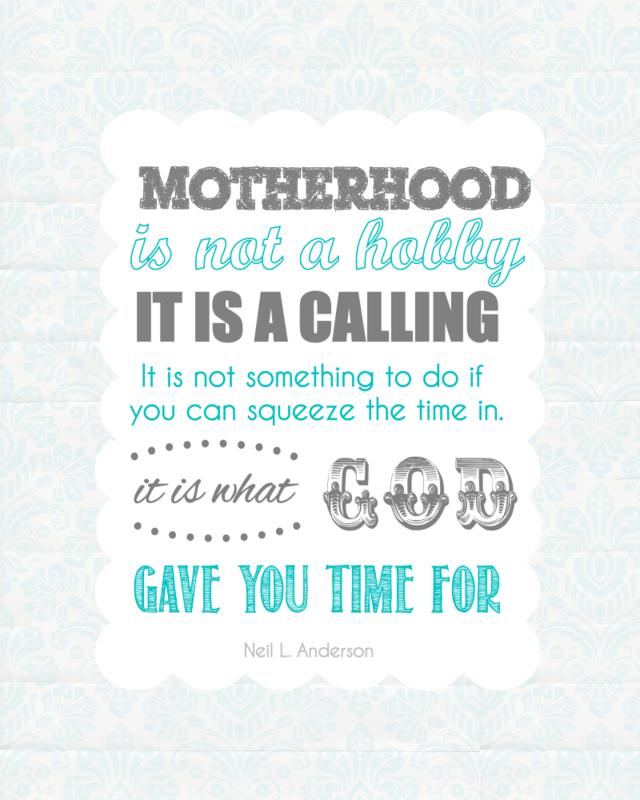 This also makes motherhood a great responsibility! The future of mankind depended on how well Eve performed her role as a mother, and our future still depends on how well mothers perform their job today! Gen 4:1-2 Adam lay with his wife Eve, and she became pregnant and gave birth to Cain. She said, "With the help of the LORD I have brought forth a man." Later she gave birth to his brother Abel. Now Abel kept flocks, and Cain worked the soil. Although childbirth was a painful process after the fall, Eve took delight in Cain's birth, and later Abel's, because it restored hope in God's love and mercy. Eve rejoices that with the help of the LORD I have brought forth a man! The expression here of "with the help of the LORD" indicates that she sees having children as a part of God's promise to restore mankind—how different from the way society views having children today! Motherhood is an honored role, part of God's plan of redemption! But the consequences of Adam and Eve’s sin remained and they continued to suffer them. Cain became jealous of his brother, Abel, who won the Lord’s favor. So Cain lured his brother out into the fields and killed him. It would seem that the destiny of all humans was nothing but suffering and death, but then something else happened. Gen 5:25-26 Adam lay with his wife again, and she gave birth to a son and named him Seth, saying, “God has granted me another child in place of Abel, since Cain killed him.” Seth also had a son, and he named him Enosh. At that time men began to call on the name of the Lord. Because of God’s love, mercy, and grace, another child was born, plus other sons and daughters, then grandchildren; and they are taught about the God who gave them life, and they learned to “worship the Lord.” With her grandson, we see the best of Eve’s efforts coming through. That’s why Eve’s name is so fitting; “the mother of all life,” instead of “the mother of death.” Because of a bad choice, she lost her original home. And it seemed like it couldn’t get any worse when her first child murdered her second child. But, with God’s help, “the mother of all life” rose above it all. She kept faith in God’s goodness. Some would say we all are suffering the consequences of sin because Eve did precisely the one thing God told her not to do. But, it’s also true to say that we are enjoying life here today, because through all her problems, Eve persevered. Most of all, in spite of her sin, Eve did not forsake her Creator. Instead, through faith, Eve received God’s mercy and grace, and we would do well to do the same. Yes, Eve made a colossal mistake. But then, so did Adam by obeying Eve instead of God. As a result of Adam’s sin, you and I disobey God every day. Fortunately, through God’s love and mercy, God let Eve become a mother. From her descendants came the amazing gift of God’s grace through Jesus Christ. Eternal life, which was lost due to Adam and Eve’s sin, is restored to mankind by Jesus Christ, to those who will receive it. While the world says that being a mom is not profession—what else can it be? All mothers work, and they work 24/7 with no vacations for years! Sure, moms don't get paid for what they do, but there are not any professions less demanding. That is why we honor them today. Some women choose a profession outside of the home rather than become mothers. Some want to be mothers, but physically cannot. Some women have been called by God to remain single. That is OK, not everyone has the same gifts or calling. Nevertheless, all these women were created to be a “helper” and deserve to be respected for their service to God and mankind. Most homes could not afford to pay someone to do all the work a mother does. Besides, a mother’s value is greater than any paycheck. What dollar value can we place on love? Fortunately, a mother’s compensation comes to her in ways more precious than money. For instance, a young boy went to the dress department of a large department store and said to the saleslady, “I want to buy my mom that pretty dress.” “What size does she wear?” asked the clerk. “I don’t know,” replied the boy. “Well, is she tall or short, fat or skinny?” asked the clerk. The boy thought for a second and then shrugged his shoulders and replied, “She’s perfect.” So the clerk wrapped up a beautiful “size 8” dress that he paid for with his own money. Two days later, Mom went back to the store and exchanged the dress for a “size 16”. There are few details written about Eve in the Bible, but by reflecting on her life, we are inspired to ask ourselves a few questions. How do you handle being tempted? Like Eve, we are all subject to being tempted to sin. We don't have a beautiful garden with some fruit hanging from a tree to stay away from, but some tempting thing is hanging all around us, just calling out to us to look, desire, take it, and taste. We have to be so careful not to be caught up in it. Are you good at handling temptation? How do you handle being a wife? Eve was Adam's helper and learned to submit to his authority. If you are married, are you where you should be in your role as a wife? Are you a helper to your husband or do you make decisions contrary to his will? How do you handle being a mother? Eve, the first mother, had to go through all the stages of motherhood that you do, but she did not have anyone to tell her how to do it. Remember your anxiety during your first childbirth? Eve didn’t have someone telling her, “It will be alright, honey-child. Women have been going through this for thousands of years.” No, she was the first to experience motherhood, all by herself, not knowing what to expect or how to do it. If you are a mother, are you happy about it? 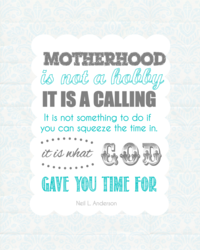 Is your role as a mother a priority? Do you have a handle on discipline? How do you interact with your kids? How do you handle your faith? Eve didn’t have a Bible or a church from which to learn about God. However, she had a relationship with Him. From her experience with God, she told her children about the Lord and how to worship Him. Do you teach your children to worship and live for the Lord by worshipping Him and living for Him yourself? I imagine Eve was a better listener and a better follower of God after her failure. How well do you listen to and obey God? How do you handle sorrow? What pain and sorrow Eve must have felt when her son, Abel, died at the hands of his brother, Cain. Adam and Eve were the first to blame themselves and shed tears over losing a child, as well as being among all the other firsts. When sorrow enters your life, do you rest in the Lord and His consolation? Although Eve's life seems so far away from us and long ago, she went through all the things you do—emotions, childbirth, motherhood, child-rearing, never-ending work, and even as a grandmother, who probably lived to see great-great-great-great grandchildren if she lived nearly as long as Adam. Eve was the first woman and mother to go through it all. She passed on her knowledge of being a wife, mother, and worshipping God to succeeding generations. Through Adam and Eve’s descendants, Christ Jesus was born—the promise God gave them in the Garden. Eve was the first to do many things, but who is first in your life? When we keep Christ first, then we begin to handle our lives like God purposed. Then we can be the wife, mother, and woman that the Lord would have us be. Then we are better able to deal with any temptations that come our way. Then we can rest in the Lord and rely on Him for comfort and consolation. For all of us, putting Christ first will help us to be the kind of Christian we should be. So, is Christ first in your life? If not, you can make Him first today. Whether you are a man or woman, we are all guilty of sin. Jesus died to atone for our sin and give us victory over sin, death, and the devil. Will you accept His gift of salvation by confessing your sin and giving your life to Jesus through baptism? He will give you eternal life—the life Adam and Eve possessed before they sinned. God, the Holy Spirit, will walk with you like He did with them in the Garden of Eden. Enter into that relationship with God by coming forward to receive Christ Jesus as your savior.